If you need a pet door, the PlexiDor is definitely a good choice. It is a high quality door that will last for many years, allowing pets to go in and out as they please while keeping weather where it belongs; outside. To make it even better, it is made in the USA, and you never need replacement flaps. 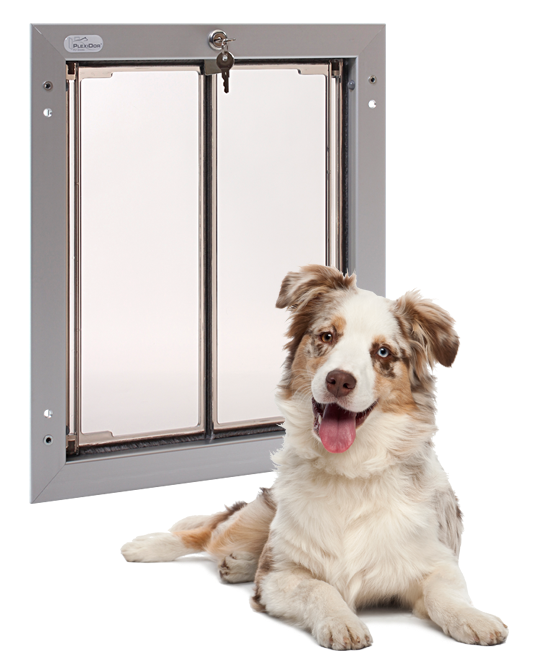 Here are answers to some frequently asked questions about the PlexiDor dog doors and cat door. If you have other questions or need an installer, don't hesitate to give us a call at 1-800-749-9609, or comment on this post. Take a look at this handy size chart. If you still have questions, call customer service at 1-800-749-9609. They will help you find the best door for you and your pets. The PlexiDor electronic pet door opens only for pets with a key. There is, however, no guarantee that a cat won’t run out together with the dog. We cannot promise that our pet door will let the dog out and keep the cats in. PlexiDor pet doors come with a 5 year warranty and a 90 day money back guarantee. If you aren’t completely satisfied with your purchase, return it and we will refund the purchase price. If we needed a door, we would be in touch, but we don't use one. Mom did train cats to use one years ago. She put one in a door in the house that went to the room with the litter box and cat food. They figured it out in no time flat!